Discuss the arguments for and against having more than one online identity. According to Internet Society “Your identity is the sum of your characteristics, including your birthplace and birthday, the schools you attended, your shoe size… [etc.]”. These things make up who you are and what you do. 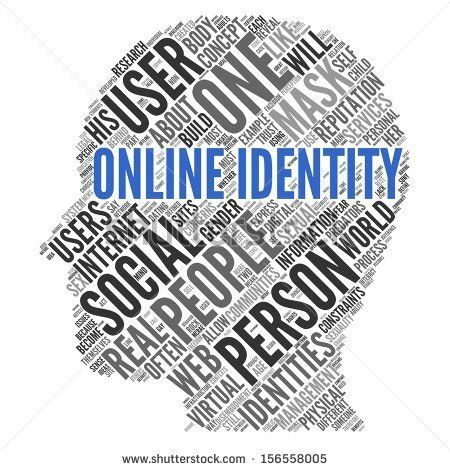 Online identity differs from real world identity due to the way people present themselves and the way they interact on the internet compared to real life. The video below explains in more detail. Partial identities are all these different representations that make up your identity. These partial identities are made when you provide personal information online such as signing up for email, ordering things online and using sites such as Facebook and LinkedIn. Essentially you are leaving a string of partial identities every time you use the internet. What springs to mind when you think of an online identity? Personally, before even reading around the subject the one thing in my mind was MTV’s ‘Catfish’. The term catfish is defined by Urban Dictionary as “someone who pretends to be someone they’re not using Facebook or other social media to create false identities, particularly to pursue deceptive online romances.” The show encourages people to apply if they are unsure about the true identity of the people they are speaking to online. According to Aleks Krotoski an expert in online comcommunity “Facebook… believes authenticity is linked to a person’s photo stream” However the show Catfish shows just how easy it is to steal people’s photos to make multiple accounts on various social media and pass it off as their own. I for one have now restricted people from viewing my pages and increased my privacy settings especially on Facebook to ensure none of my personal information can be taken. However this is obviously the very worst case scenario of multiple identities online and not everyone’s intention is to ‘catfish’ in order to make friends etc. A positive of having multiple identities online allows users to be social on sites where only their friends can see, but then equally have accounts purely for professional purposes such as LinkedIn. Do you represent yourself the same on LinkedIn as you do on Facebook? I can imagine the answer is probably no, unless you decided to wipe your Fresher’s week pictures from Facebook. Personally I keep all my social media very restricted because I am conscious that potential employers will search for my accounts online and have access to my social life. This is a scary idea as even in the real world there is a strict divide between work and social life and I think it is important to keep this divide online too. Backer. S. (2010). Catfish. Available: http://www.urbandictionary.com/define.php?term=catfish. Last accessed 25th Oct 2016. Jetsetshow. (2010). 7 Steps To Building Your Online Identity. Available: https://www.youtube.com/watch?v=2UlcOX1fZW4&feature=youtu.be. Last accessed 25th Oct 2016. Joseph. M. (2012). CATFISH: THE TV SHOW TRAILER . Available: https://www.youtube.com/watch?v=CMA4x7aXJT0. Last accessed 25th Oct 2016. Krotoski, A. (2012). Online identity: is authenticity or anonymity more important? . Available: https://www.theguardian.com/technology/2012/apr/19/online-identity-authenticity-anonymity. Last accessed 25th Oct 2016. Lee, N. (2016). Having multiple online identities is more normal than you think. Available: https://www.engadget.com/2016/03/04/multiple-online-identities/. Last accessed 25th Oct 2016.
rdigitalife. (2012). Identity: Are you the Same Person Online & Offline? . Available: https://www.youtube.com/watch?v=10K137WU9gw. Last accessed 25th Oct 2016. I like the fact that researching further into this topic meant that you actually reflected on your own online identity, for example your privacy settings. Having a divide between your professional and personal identities is also a positive that I mentioned in my blog. My question to you, is at what point should these identities overlap? For example, having your manager on your personal Facebook. Would this not break any divide that was intended? I thought about it whilst writing my blog post and failed to answer it. I wondered whether it created perhaps a third identity, for those people who have access to both your work and social accounts. Perhaps, they would see a more ‘complete’ you in a sense, by seeing both sides. It would be good to hear your thoughts back on the topic. I think that these identities will naturally overlap to some extent, however with the example you gave of a manager in mind I think that there is obviously things you would keep hidden from a manager. E.g. your pictures from University etc. In terms of having a manager on Facebook personally that is something I would never do as I like to have some privacy when it comes to my social life away from work. I would have to agree with you when you say people having access to all of your identities online such as professional and social would have a more ‘complete’ view of you. But, if there is no divide what is the point of making your Facebook different to your LinkedIn? I liked the layout of this post as it included video extracts to solidify your points and display more information. I found the mention of partial identities interesting as this was not something I came across during my research. It seems due to us leaving traces of our identity online, access to only a few companies’ details could mean our full identities could be compromised. This, as you later say, is why privacy settings are very important to make sure this information is only shared with the appropriate people. I liked your reference to Catfish which brought in some popular culture to the topic while still answering the question fully. The post has a lot more of a personal feel than your last post which I feel is definitely an improvement. Do you think the side that you would present to employers would be an accurate representation of you? Once again thank you for your comment! In answer to your question, I think that the side I present to an employer is to an extent an accurate representation of myself. Obviously there are certain things I may not wish them to see on my Facebook such as my social life. However, I think this is true in everyday life too. I feel it is important to have a boundary between work and what you do in your spare time. To share everything about me with an employer (whether online or not) I feel would be bordering on inappropriate.